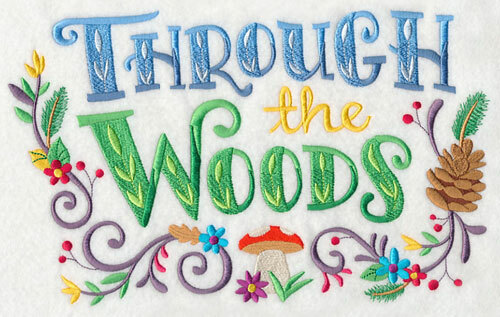 Take a walk through the woods with this week's new designs! Woodland animals, falling leaves, outdoors landscapes, and more will bring the beauty of the forest inside your home. 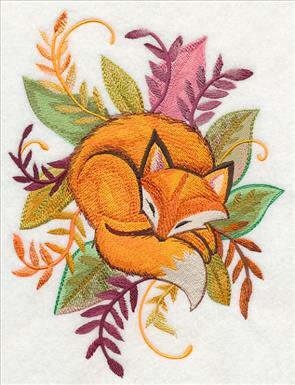 Adorn a pillow with a striking watercolor fox, or give your favorite bookworm a bookmark featuring their favorite wild animal. 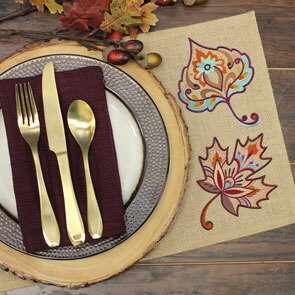 Eye-catching autumn leaves are the perfect solution for seasonal table linens and quilts. 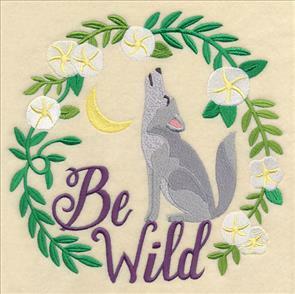 Plus, floral wreaths, contemporary animals, sayings, and more! 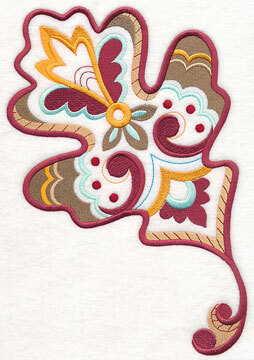 Scroll down the page to see the beautiful woodsy designs. 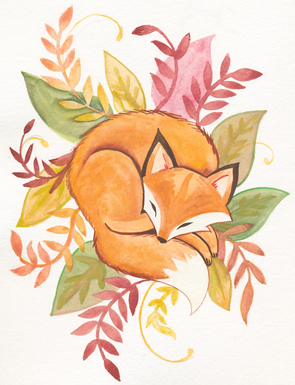 A fox curls into its nest of leaves and other fall foliage in this magnificent watercolor design. 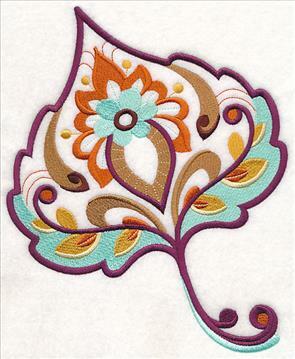 Perfect for pillows, wall hangings, and quilts, the eye-catching motif will add the beauty of autumn to any project! 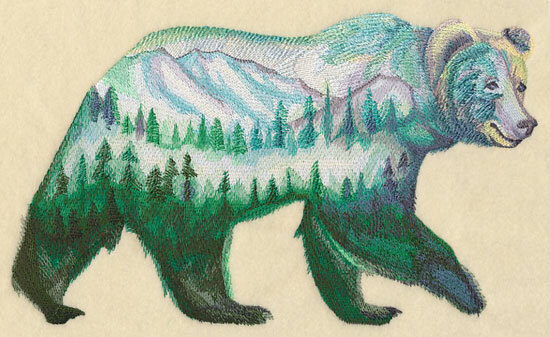 6.87" x 9.06" and 5.89" x 7.77"
A breathtaking watercolor landscape of the mountains and forest give this bear an unexpected, and striking appearance. 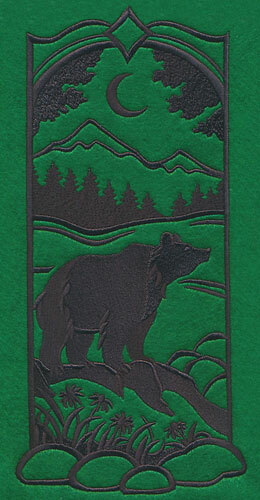 Stitch the picturesque wilderness display as art for your home, on a wall hanging, or a quilt. 11.33" x 6.88" and 9.38" x 5.70" and 7.78" x 4.74" and 6.83" x 4.16"
Perfect for a cabin or living room decor, this landscape silhouette is sure to impress any guest. 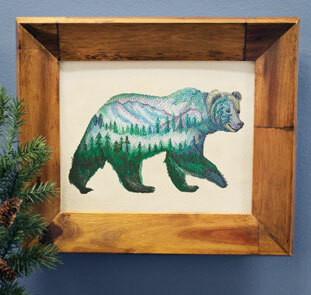 The painted aspect of the design makes it particularly beautiful as a piece of framed art. 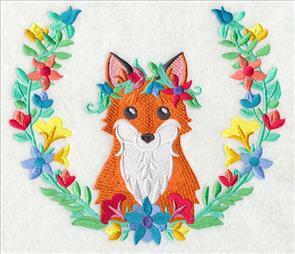 See how to frame embroidery right here. 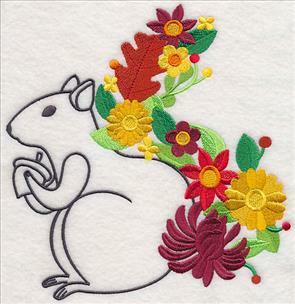 The falling of autumn leaves signifies the start of the season. 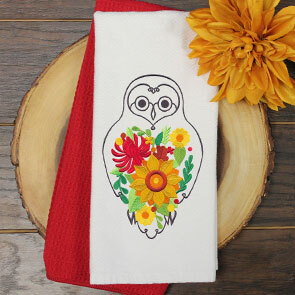 Stitch these stunning designs on table linens, decor items, apparel, and more to show your love for fall. 6.82" x 7.80" and 6.14" x 7.03"
5.58" x 6.39" and 4.86" x 5.56"
6.90" x 10.43" and 5.86" x 8.86"
5.16" x 7.80" and 4.54" x 6.86"
These leave feature open space where the fabric shows through. 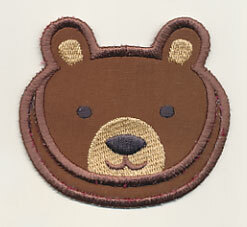 Stitch them on light, low-nap materials such as linen, twill, denim, cotton, or canvas for best results. 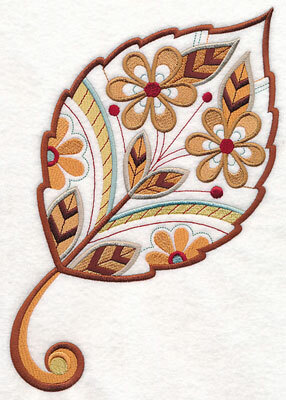 Here, two leaves are used to create a beautiful place setting for any table! 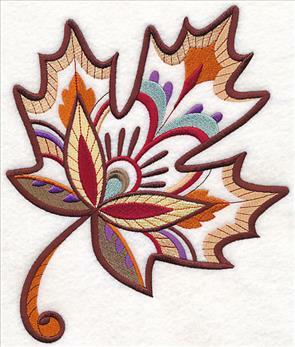 Six different types of leaves have been created in this stunning style -- maple, oak, birch, cottonwood, elm, and ash. Beautiful details and classic autumn colors give each design an eye-catching look. 7.25" x 7.80" and 6.56" x 7.07"
5.86" x 6.31" and 4.86" x 5.24"
6.88" x 8.14" and 6.15" x 7.27"
5.59" x 6.61" and 4.86" x 5.75"
These leaves are the perfect way to update a quilt, kitchen towel, table runner, or bedding set. 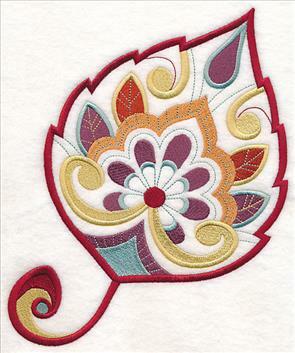 The stunning accents inside each of the leaves make them terrific for stitching all autumn long. 6.90" x 9.15" and 5.88" x 7.79"
5.34" x 7.08" and 4.86" x 6.44"
5.95" x 10.32" and 5.17" x 8.97"
4.50" x 7.80" and 3.95" x 6.85"
Let these leaf designs land on your next project! Purchase them individually using the links above, or get them all in a design pack. 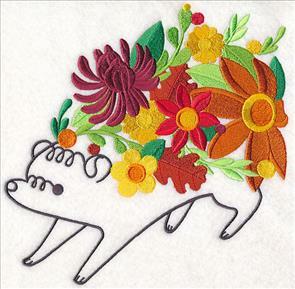 Contemporary, line-drawn animals get a brilliant burst of color thanks to bright autumn blooms in these designs. 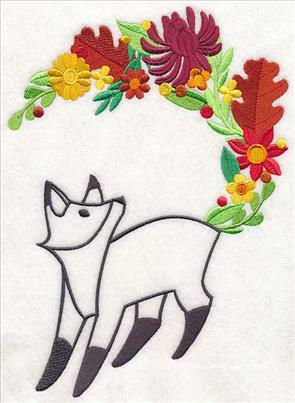 Each forest friend has one element made up of the beautiful flowers and leaves -- here a fox's tail and the feathers of an owl feature the colorful accents. 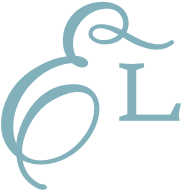 6.85" x 9.53" and 5.86" x 8.15"
6.87" x 11.11" and 5.82" x 9.41"
4.82" x 7.79" and 4.26" x 6.88"
The outline of the animals feature open spaces where the fabric shows through, making them gorgeous additions to solid-color fabrics. 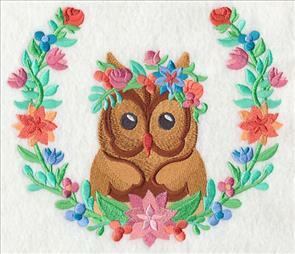 Add to a kitchen towel, or use to adorn a blank pillow! 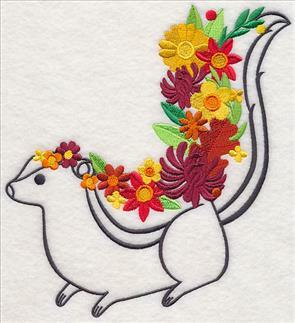 A hedgehog and a squirrel are classic woodland animals, and showcase the beauty of the fall flowers and leaves wonderfully. Change the colors of the accents to fit your color scheme or favorite season -- pastels for spring, bright colors for summer! 7.77" x 7.76" and 6.89" x 6.88"
7.51" x 7.80" and 6.80" x 7.06"
5.87" x 6.10" and 4.86" x 5.05"
A deer's antlers and skunk's stripe are surprisingly striking when exchange for these vivid blooms. 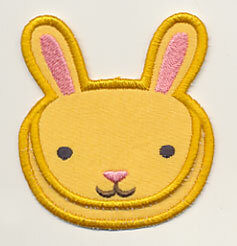 Add to a tote bag, sweatshirt, or pillow for fall! 7.14" x 7.79" and 6.42" x 7.00"
7.09" x 7.79" and 6.45" x 7.09"
5.81" x 6.39" and 4.86" x 5.34"
Bring the contemporary beauty of these designs to pillows, quilts, and more. Purchase them individually using the links above, or get them all in a design pack. 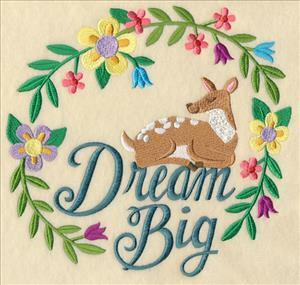 Inspire your little ones with sweet woodland wreaths touting words of wisdom. 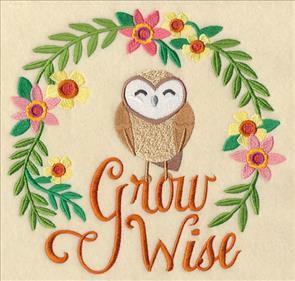 An owl encourages you to "Grow Wise;" a fox to "Stay Clever." 7.79" x 7.40" and 7.27" x 6.90"
7.79" x 7.43" and 7.21" x 6.89"
6.12" x 5.85" and 5.09" x 4.86"
All five of these designs feature a classic woodsy animal that coordinates with their saying. Forest blooms encircle them with simple beauty. 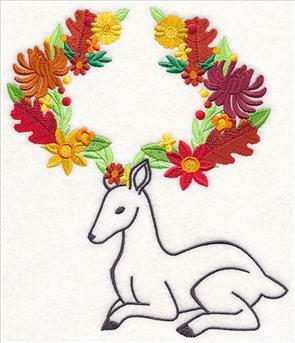 7.80" x 7.58" and 7.10" x 6.90"
Stitch all five of the wreaths on a quilt, wall hangings, or series of framed pieces. 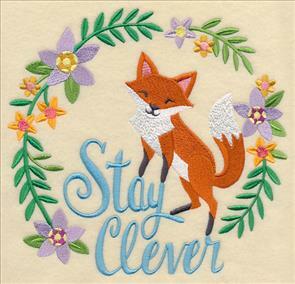 Or, pick your favorite to embroider on a pillow or tote. 7.81" x 7.54" and 7.11" x 6.86" and 6.07" x 5.86" and 5.03" x 4.86"
Stitch these uplifting wreaths in your home for a daily dose of inspiration. Purchase them individually using the links above, or get them all in a design pack. 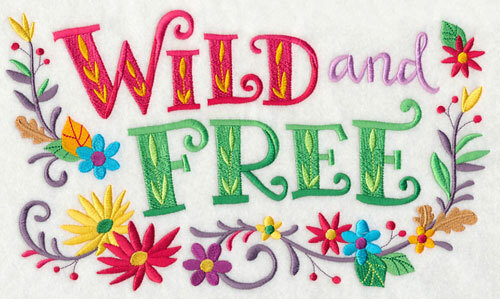 Share your wild spirit with the world by stitching this vibrant saying on messenger bags, T-shirts, framed artwork, and more. Change the colors to match your style, a particular season, or decorating scheme. 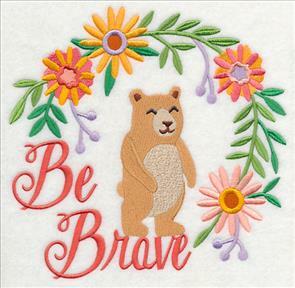 11.75" x 6.85" and 9.41" x 5.48" and 7.81" x 4.55" and 6.85" x 3.99"
A design saying "Through the Woods" is the perfect addition to cabin decor, gardening gear, or a welcome flag. Leaves, a pinecone, and a mushroom continue the woodsy theme. 11.11" x 6.89" and 9.40" x 5.82" and 7.80" x 4.88" and 6.88" x 4.28"
Kids' gear, nursery decor, tote bags, and more will get a bright and colorful update with these floral laurel designs! 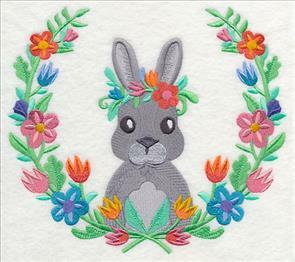 Classic woodland animals adorned with a flower crown are framed in a brilliant array of blooms in these charming designs. 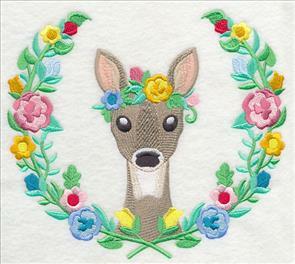 7.81" x 6.78" and 6.75" x 5.86" and 5.57" x 4.84"
A deer, fox, owl, and bunny are sweet additions to pillows, quilts, wall hangings, and more! 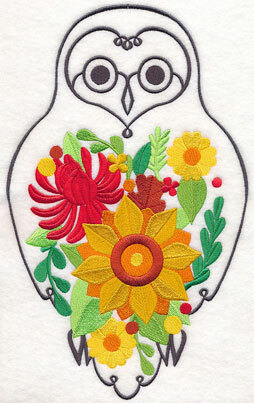 Use them all together, or pick your favorite animal to stitch alone. 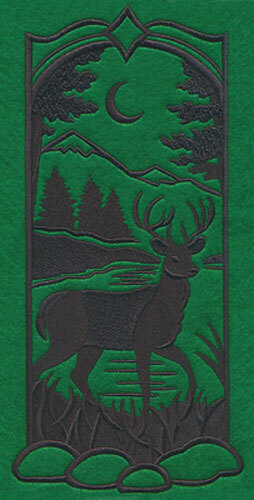 7.80" x 6.89" and 6.64" x 5.86" and 5.49" x 4.84"
Wilderness scenes featuring the flora and fauna of the forest are gorgeous additions to a wide variety of projects. 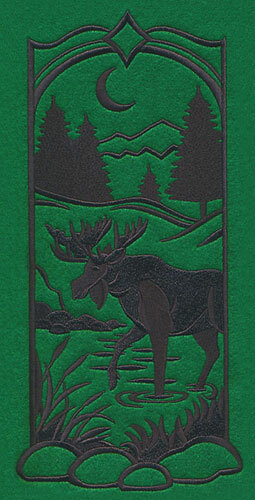 Each depicts the silhouette of a wild animal exploring the woods by the light of the moon. 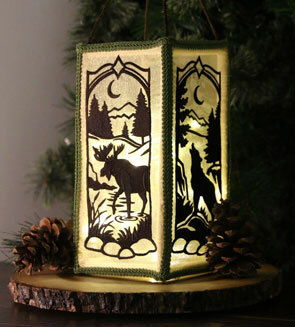 5.56" x 11.75" and 4.44" x 9.38"
3.70" x 7.81" and 3.25" x 6.86"
Create a glowing luminary for your cabin or home with these silhouette designs. Each panel makes up one side of the lantern (and stitching them on organza lets the light shine through beautifully!). 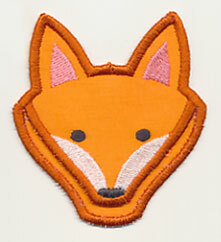 See how to make your own luminary in this project tutorial. 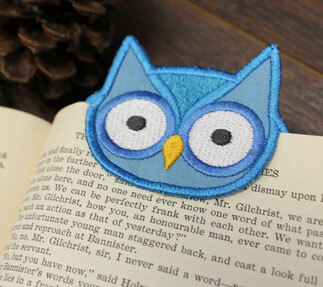 Let a cute woodland friend mark your page in your current read with these in-the-hoop bookmarks! 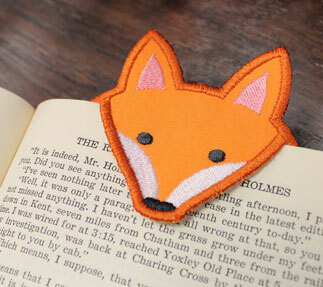 A fox, owl, bear, and bunny are adorable ways to keep your place while reading! The page of your book slides in-between the two layers of the bookmark, making it easy to keep track of where you left off reading. 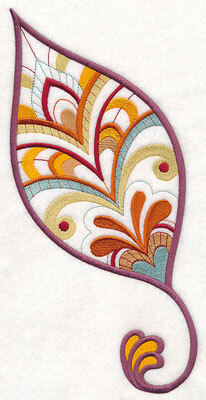 See how to make these in-the-hoop peeking bookmarks in this project tutorial! Not only are these wild and woodsy bookmarks perfect for your everyday reading, but they're also terrific to give as gifts, too. 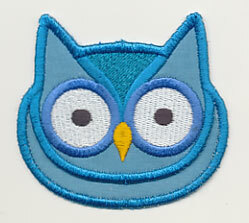 Give to your favorite bookworm, or as party favors for kids, too. 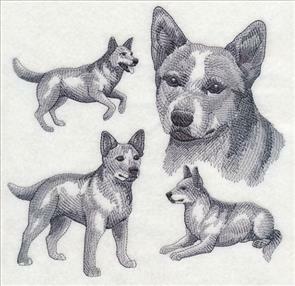 Ann has a Red Heeler pup, and was hoping to see designs featuring the gorgeous breed of dog. Great suggestion, Ann! 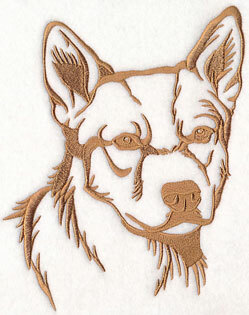 Add this sketch and silhouette to totes, pet beds, and more. 7.80" x 7.58" and 7.08" x 6.88"
5.86" x 7.73" and 4.86" x 6.41" and 2.94" x 3.87"